“Twenty-first century intelligence suffers from long term historical amnesia.” The first line of Christopher Andrew’s majestic work on the history of intelligence is certainly true not only of the intelligence profession, but of far too many political, diplomatic, and military leaders as well. Fortunately, in this work, astounding in both its narrative excellence and depth of research, Mr. Andrew goes a long way in closing this gap, presenting a global history of espionage and spy craft from Biblical times to the Global War on Terrorism. As the author note in the introduction, writing a comprehensive history of intelligence can be extremely challenging due to the dearth of primary source information, much of which still remains classified, or has been lost for various reasons. The author’s surprising access to recently declassified archival material, as well has his role authoring an authorized history of MI-5, Britain’s Security Service, makes this an even more remarkable book as he punctures many historical myths and provides some insightful analysis to accompany the brisk narrative. Histories of espionage from the 20th century abound, especially concerning World War II and the Cold War. Even the story of George Washington and his management of America’s first spy ring has enjoyed a recent popularity. But these tales only scratch the surface of man’s use of spies and secrets, which goes back to antiquity, and the old saying that espionage is the world’s second oldest profession is certainly true. 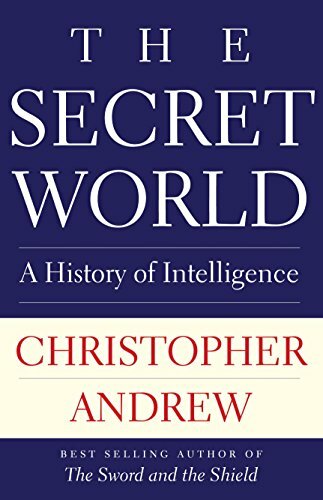 He covers the gamut of history, beginning with a fascinating comparison of the use, or lack of use, of intelligence by the ancient Greeks and Romans with the far more rational incorporation of spies, saboteurs, and even covert action by the ancient Chinese and Indians. Moving quickly through hundreds of years, the narrative covers diverse topics like the commercial intelligence of Venice during the Renaissance to the merging of intelligence, politics, and grand strategy in the Elizabethan era, to the “great game” between the British and Russians in South Asia during the 19th century before concluding with the World Wars, the Cold War, and the current global war on terrorism. The book offers a number of illuminating case studies, some of them a bit Anglo-centric, that highlight the ebb and flow of collection, analysis, and ultimately the incorporation of intelligence into statecraft. Two examples show the author’s skill at highlighting little known, but crucial intelligence triumphs or blunders. Although George Washington has received a great deal of recent notoriety for his use of spies, Benjamin Franklin probably had a more significant impact on the course of the Revolution as the head of the American delegation in France. Calling Franklin a master of “influence operations,” Mr. Andrew notes his mastery of disseminating propaganda and “managing perceptions” ensured the Franco-American alliance critical to the final defeat of the British at Yorktown in 1781. However, one of the great historical blunders of the United States that will surprise many students familiar with the success of Japanese code-breaking efforts by America cryptanalysts prior to the war was the bureaucratic infighting between the Army and Navy in the period leading up to the attack on Pearl Harbor. The truly absurd plan devised by America’s military leaders to allow the Army and Navy to take alternate days of Japanese traffic for code-breaking is mind-blowing. Moreover, as many histories of Pearl Harbor note, what intelligence was available was not shared with either the Army or Navy commanders in Hawaii or other Far Eastern outposts. What has not been generally known is the convincing case Mr. Andrew presents that there were more than enough intercepted Japanese Navy messages available prior to the attack to point to a Japanese plan and preparations to attack the Navy’s Hawaiian base, but because of the byzantine bureaucracy used by the Army and Navy and the lack of dedicated SIGINT personnel in both services, these messages were not decrypted or analyzed until after the war as part of a secret post-war study. The author concludes, quite correctly, “Academic historians have frequently tended either to ignore intelligence altogether, or treat it as of little importance.” An excellent example of this is the fact that much of the history of World War II, often based on the official histories written after the war, had to be significantly revised when the existence of the Ultra decryption program was made public in 1974, nearly 30 years after the end of the war. While written for a general audience, this book should be on the shelf of every student of diplomatic and military history. There are not a lot of books that can be said to change the historiography of events, but this stands as one of them. Any intelligence professional would also benefit from this book, which shows that even in the constantly changing world of espionage, we can still learn a great deal from our ancestors.